If you are looking for photos of a super clean lathe, this review isn't for you because I USE the tools I review to get the best info I can for you. In this case, the best info is that if you want a small metalworking lathe you owe it to yourself to check this offering from JET. The metal turning lathe has always been an anchor machine in home shops to full-on industrial settings. The JET BD-920W Belt Drive Lathe has a space-saving footprint without skimping on power and capabilities that fit these settings very well. The version shown in this review (#321155K) includes a nice stand/cabinet designed just for the JET BD-920W Belt Drive Lathe and offers solid support with lots of always-needed storage space. The JET BD-920W Belt Drive Lathe has a 9” swing over the bed and a between-centers capacity of 20-inches. The swing over the cross slide is 5-5/16”. The spindle is supported by heavy-duty tapered roller bearings with a (through) bore of 7/8” giving this machine an exceptional bar stock range. To keep the JET BD-920W Belt Drive Lathe compatible with a wide range of aftermarket accessories the spindle mount has the common 1-1/2 x 8 threads per inch on the outside and a #3 Morse taper inside. 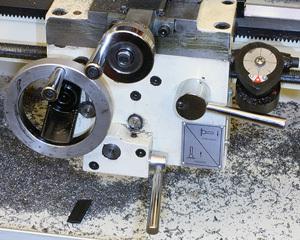 The JET BD-920W Belt Drive Lathe features hardened and ground bedways for long term accuracy. The carriage that moves the cutting tool is easily adjusted to minimize backlash that may develop for heavy users’ years down the road. Combined with the power longitudinal feed and a reversing switch the JET BD-920W Belt Drive Lathe can handle normal and reverse turning procedures. The quick change gearbox offers a wide range of inch and metric threads that can be cut precisely on the JET BD-920W Belt Drive Lathe. The spindle drive can work off of two different stepped pulleys (left) to get the surprisingly large RPM selection available. This is the threading gear train (right) and we will look more closely at that operation in a separate story. suffice it to say that this lathe does threading very well. The JET BD-920W Belt Drive Lathe is powered by a rugged ¾-hp, 1Ph, 115V motor with a cast iron housing that dissipates heat very efficiently to extend its working life. This lathe features two distinct speed ranges achieved through two different stepped drive pulley systems that increases its versatility. With the belt on the motor pulley you choose from 400 – 1000 and 2000 rpm. Move the belt to the reduction pulley and you get 130 – 300 and 600 rpm. The tailstock is rugged and easy to use. It features a self-extracting spindle with #2 Morse taper for wide accessory compatibility. The tailstock can also be adjusted off center up to 5 degrees to help make long taper cuts. Other standard equipment includes a full length splash guard across the back of the JET BD-920W Belt Drive Lathe to help keep the area surrounding it clear. This JET BD-920W Belt Drive Lathe comes with a cabinet/stand to which it is bolted. In addition to much needed storage the top of the cabinet has a raised edge pan that catches much of the debris turning creates for easy cleanup. Jet also includes a 4”, 3-Jaw scrolling chuck with threaded back plate. This chuck with stepped jaws that grip the inside diameter of tubular stock as well as solid bar stock at the center of the jaws. Another set of reverse stepped jaws are included that grip the outside diameter of larger stock to increase the versatility. You also get a 7” 4-Jaw (non-scrolling) chuck with threaded back plate that gives you more alternatives for chucking irregularly shaped stock or for off center turning jobs. JET also includes a faceplate for even more odd shaped jobs. You can use the faceplate with a drive dog and the adjustable tail stock for long taper cuts and more. The tailstock can be offset 5-degrees to the front or rear of the machine. JET includes #2 and #3 Morse taper centers to work with other included attachments to further expand the capabilities of this machine. You get a full scrolling 4", 3 jaw chuck (left) plus a set of reversed jaws to change from grabbing the inside to the outside of stock. 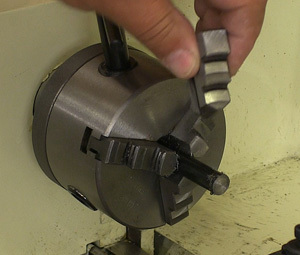 The 7" 4-jaw chuck (right) is not scrolling but comes in handy for irregular pieces or offset turning. You get 9 gears that can be swapped out in the drive train for threading. The JET BD-920W Belt Drive Lathe is capable of cutting 30 inch threads from 8 to 60 threads per inch. You can also cut 18 metric threads from 0.4 to 3.5. 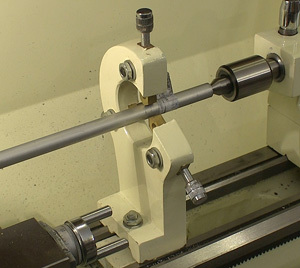 The JET BD-920W Belt Drive Lathe has a cross slide with a manual feed. The feed crank has a repositionable graduated ring that lets you set and then return to a known cutting depth or tool position. The compound can be pivoted for things like short taper cuts or when cutting tool design requires a certain presentation to the work. A standard 4-way tool post is included and works with all basic cutting tools and many attachments. This machine is compatible with many aftermarket tool holders including the quick change set you get in the 12pc Mini Turning Tool Kit (#660215) JET offers as an accessory. 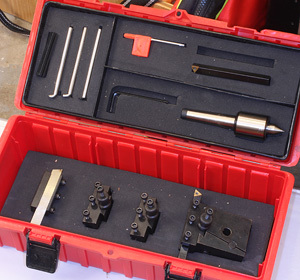 This kit comes with a quick change tool post and 3 holders, a parting tool holder with a HSS blade, #2 Morse taper live center, 2pc index able turning tools (right & left hand) a boring tool and a HSS internal threading tool. 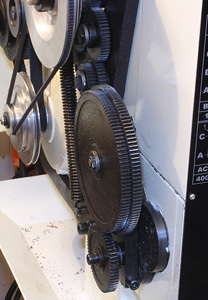 The JET BD-920W Belt Drive Lathe has a precisely made lead screw that is driven by the quick change gear box. This lets you engage an auto feed to move cutting tools along the stock smoothly. You can also engage the lead screw using the threading lever/threading dial for cutting the many thread variations available. 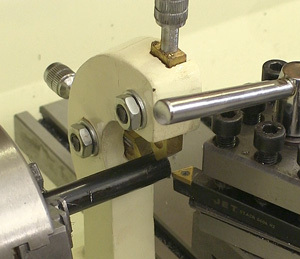 A selector handle on top of the power head lets you change the lead screw rotation to cut normal or left hand (reversed) threads with the same setup. JET includes the follow rest (left) that mounts directly to the carriage so it moves with the cutting tool to give support behind the stock. the free-standing steady rest (right) mounts to the bed and supports long stock to prevent whip and vibration during cutting. The lead screw really is a key part of a lathe as it can help you produce smooth consistent cuts that just are not possible when moving the carriage manually. Being able to move other types of tools at consistent, controllable rates helps you produce professional looking and more importantly accurate cuts. A good lead screw also makes the JET BD-920W Belt Drive Lathe compatible with a wealth of aftermarket tooling and attachments you may want to use later. The JET BD-920W Belt Drive Lathe comes with a follow support and a free standing work support. Both of these fixtures help reduce flex of the work piece during cutting. Both fixtures can be removed easily when not required for the current job. The follow support mounts directly on the carriage and as the name suggests, it moves with the cutting tool, supporting the material from behind. The free standing support is used for long work pieces and is located close to the middle but out of the way of the carriage. This support prevents whipping that can develop as the cutting tool applies pressure to a long piece of stock, usually running between a chuck and a center in the tailstock. One of the things that attracted me to the JET BD-920W Belt Drive Lathe is its size and range of capabilities. I also liked the lack of high-tech devices that would make it more difficult for someone new to a metal lathe, like me and a bunch of you reading this because you are thinking of getting one. That makes it easier for us to learn how to make use of the JET BD-920W Belt Drive Lathe accuracy and solid range of capabilities that make it useful in a home shop or small professional shop. 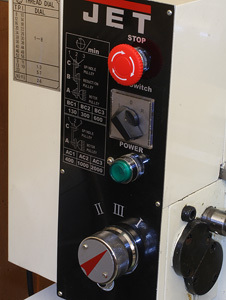 The carriage controls (left) and overall machine control panel (right) are easy to use and understand. They are also very much like what you will find on larger lathes. I would strongly suggest getting the 12pc Mini Turning Tool Kit (#660215) as I did because you will have to buy most of what is in it to get started anyway. Combined with the JET BD-920W Belt Drive Lathe this accessory outfit means you can do lots of turning right out-of-the-box. Despite being an 115V machine the JET BD-920W Belt Drive Lathe seems to have plenty of power for all cutting and threading jobs I tried. I’m sure if you get stupid with cutting depth that you can stall this (or any) lathe out but for any sane amount of material removal this machine has plenty of guts. It is also very smooth running which helps let the tools produce a clean surface. The handles that move the carriage and upper slides were a little stiff initially but became smooth and easy to turn with just a little use. I suspect some of this is the “shipping gunk” all machines are covered in when you first get them. That “gunk” did its job and the JET BD-920W Belt Drive Lathe arrived rust-free. Also I could not find any play in the carriage or slides. Everything seemed well adjusted from the factory. Because cut depth is so important the cross slide handle has a repositionable ring that is graduated in one thousandth increments. In most cases you make a light clean up cut on the surface to get it fully round and set this ring to zero. Then you can adjust the cross slide to remove the amount of material desired. The cross slide ring shows the actual amount of material being removed. If you set the ring to remove five thousandths of an inch it reduces the overall diameter by twice that, or ten thousandths of an inch. 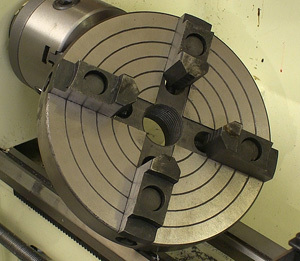 Some lathes have rings that show the overall amount that the diameter is removed. I personally like this arrangement but either is easy enough to get used to. 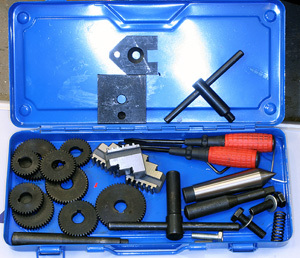 The included tool kit (left) gives you necessary hand tools, gears for threading, extra scroll jaws and more. The 12-pc tool kit that I got (right) really gives you things you are going to need to get started turning. I highly suggest getting this outfit with the lathe. The standard 4 position tool holder that came with the JET BD-920W Belt Drive Lathe does work but you will find yourself having to shim some cutting tools to get them at the centerline of the stock. This certainly is not exclusive to this machine but rather a completely normal trait of that type of tool holder. 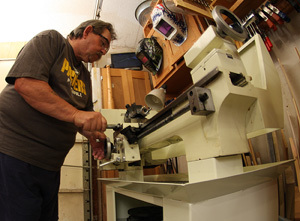 (See my story on shimming a lathe tool – Click Here Here again the optional tool set came in handy with the quick change holder system making life at the lathe easier. Despite the speed with which you can change tooling the quick change holder does not sacrifice stability or resistance to vibration. This holder along with the tooling that comes in the 12pc Mini Turning Tool Kit (#660215) just let you work more efficiently. 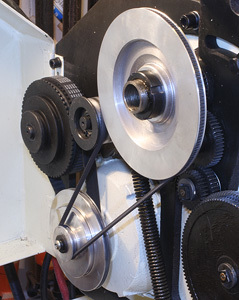 A key feature of any metalworking lathe is threading and the JET BD-920W Belt Drive Lathe is no slouch there either. Looking at the threading chart the first time was a bit intimidating but once you understand the mechanics of this process the chart makes way more sense. Something else I noticed with the JET BD-920W Belt Drive Lathe is that with many lathes in this class you have to take several “spring cuts” to finish threads. Spring cuts are where you literally recut the threads over and over without changing the cutting depth. This is to remove excess material left by “spring” or slop in the tool holding system under pressure. You have to take spring cuts with any lathe but the good ones, like the JET BD-920W Belt Drive Lathe only need two or three passes to get to where it is not removing any further material. That shows us that everything is close fitting and properly adjusted on the JET BD-920W Belt Drive Lathe right out of the box. Evaluating the JET BD-920W Belt Drive Lathe turned out to be one of the reviews I was happy that I did. I have toyed with the idea of getting a metal lathe for a long time but worried about the learning curve, possibly made worse by a less capable machine that fit the budget. At this writing (5-23-2014) the JET BD-920W Belt Drive Lathe is selling on the street for about $1950.00 and the stand for $397.00. I frankly expected the cost to be higher but even noticed some sales on these machines at times that knock the price down a little more if you catch them. If you are considering a small lathe you need to take a look at the JET BD-920W Belt Drive Lathe. I think this is a good choice that can also serve as a basis for when you learn more and begin to add aftermarket tooling to expand its capabilities even more.